Top New York ICE Officer Sues Napolitano For Discrimination Against Men : The Two-Way The lawsuit alleges that the Homeland Security secretary has turned the agency into a "frat house." The officer in charge of the Immigration and Customs Enforcement office in New York has filed a lawsuit against Homeland Security Secretary Janet Napolitano. James Hayes Jr. alleges that the department, under Napolitano, has been turned into a female-run "frat house" and that Napolitano promoted women because of friendship instead of merit. 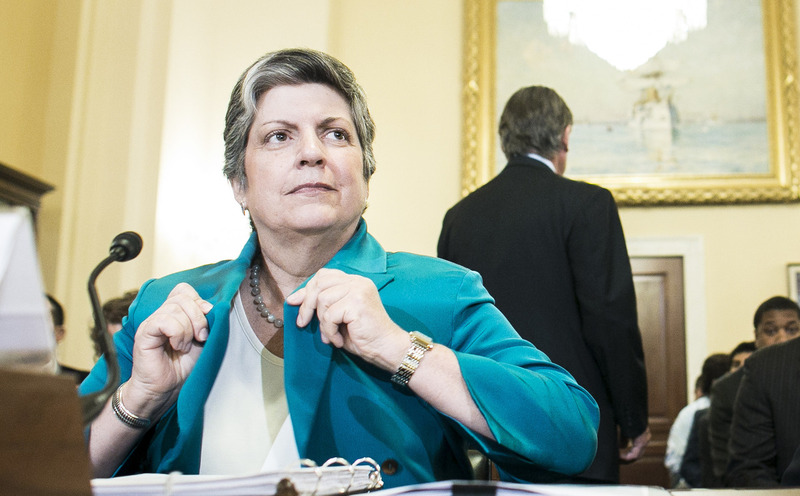 The lawsuit alleges that Napolitano hired two friends who have tormented the men of the agency. "The suit identified them as Dora Schriro, who is now running the city Department of Correction, and Suzanne Barr, the chief of staff for the U.S. Immigration and Customs Enforcement. "Soon after Schriro and Barr were hired in January 2009, male staffers were treated like lapdogs, Hayes claims. "Barr 'moved the entire contents of the offices of three employees, including name plates, computers and telephones, to the men's bathroom at ICE headquarters,' the suit says. ... Sometimes, Barr took a more direct approach. In one case, she called a male colleague in his hotel room and screamed at him using sexually humiliating language, the suit says." Brian P. Hale, a spokesman for ICE told Forbes that they will not comment on "unfounded claims" and that the agency "will respond to Mr. Hayes' allegations as appropriate through the judicial system." Hayes filed his complaint in May. But it was first reported by the conservative blog debbieschlussel.com on Wednesday. Today, the story is picking up some steam. Debbie Schlussel has posted the 21-page complaint on her website. In it, Hayes' attorneys try to paint a picture of a man who started off as a border patrol agent in 1995 and worked up through the ranks, reaching the position of ICE Detention and Removal Operations in which he managed 8,500 employees and a $2.5 million budget. It all began to fall apart, the lawsuit alleges, when Napolitano hired Schriro and Barr. Among other, more salacious allegations, Hayes says that when he insisted he was being discriminated again, the agency hit him with several investigations that came up empty. Hayes is now seeking $335,000 in damages.